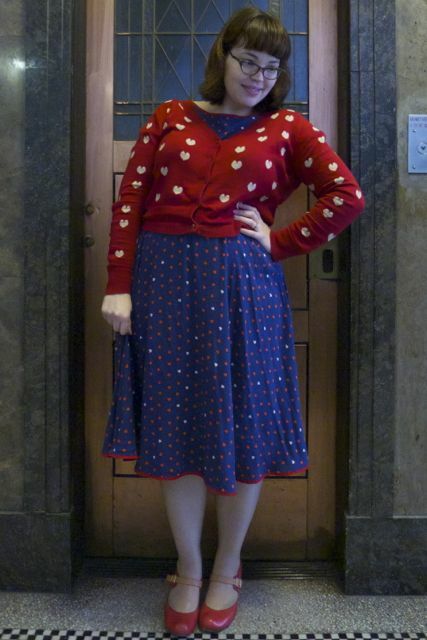 The promise of spring is in the air, and I’m dusting off some of my warm-weather dresses. 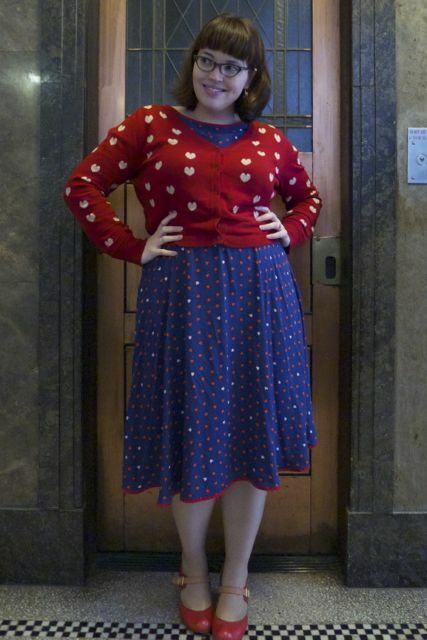 It’s still too cold to completely eschew the cardigans though. This Asos Curve dress is a favourite (though it creases annoyingly quickly, simply hanging in the wardrobe). The heart print fabric made it a must-buy the moment I found out it wasn’t as crotch-skimmingly short as the product photo suggested it would be. 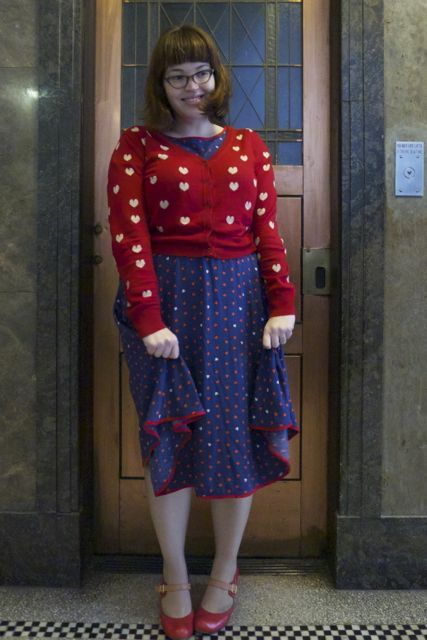 The heart print cardigan from Dangerfield was ALSO a must-buy when I saw it (hearts? who doesn’t love ’em?) even though it was overpriced. Put them together, and maybe it’s overkill, but I quite like it anyway! This is probably the first of many times that you’ll be seeing this tartan kilt skirt in the months to come. 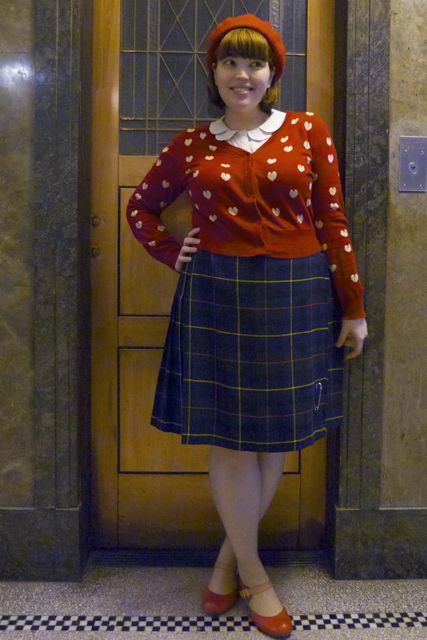 I’ve had my eyes open for a pleated plaid skirt for some months now, but it wasn’t until my gorgeous friend Liah picked up a corker at the Kongwak Markets that my vague desire turned into a Must-Have obsession. I was looking seriously at getting a kilt custom made in my maternal grandmother’s traditional Mackinnon Clan tartan, but including shipping the price was too prohibitive, and I couldn’t quite understand the difference between the different wefts and weaves. 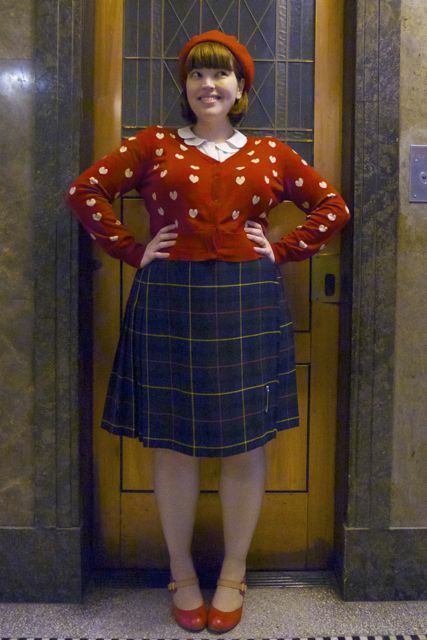 In the end I turned to eBay, and after trawling through pages of vintage tartan skirts for 18″ waists I finally happened across two, TWO, perfectly excellent vintage skirts that would fit me well. I didn’t actually MEAN to buy both of them: They both had bids on them, and I couldn’t decide between them, so I tossed a coin, put a small bid on one, and a larger bid on the other… and neither of the other bidders placed a second bid so I won both. MEANT TO BE! 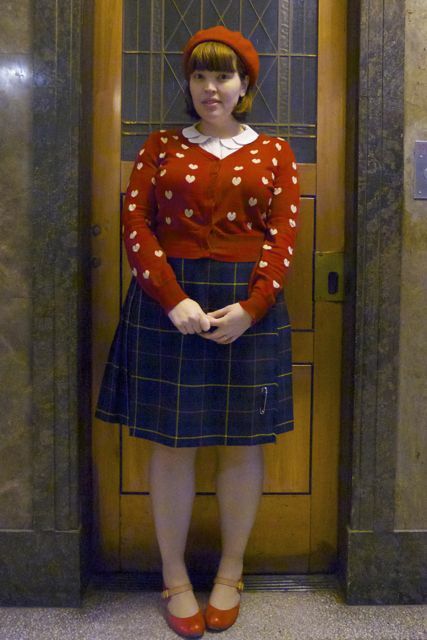 I never had to wear a tartan skirt for my school uniform, so I never had the loathing for kilts ground into me (but have you ever seen me in forest green? No.) which means I can channel my frustrated English Private Schoolgirl as much as I like. 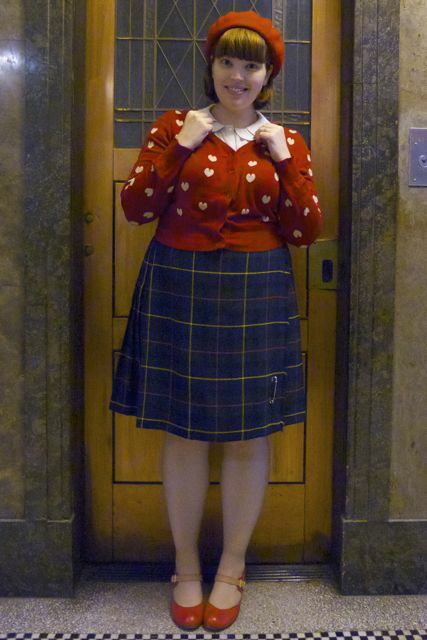 That said, after being told by someone that I was wearing their high school uniform, I’ve been trying to whimsyfy my outfits, so you’ll be seeing my plaid skirts teamed with love heart cardigans and polkadot tights rather than knee high socks and school ties. 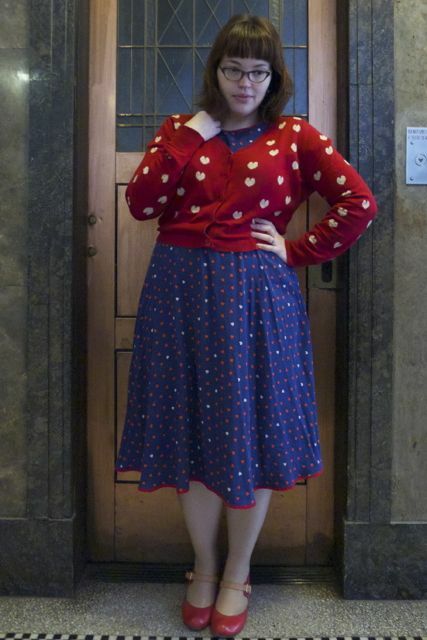 I couldn’t give up the peter pan collar though!